Over the past decade, the ASEAN region has been back on the radar of Japanese banks in their efforts to expand globally. While the relative size remains small, Japanese banks’ lending to ASEAN has grown the fastest, rising almost fourfold since 2009. 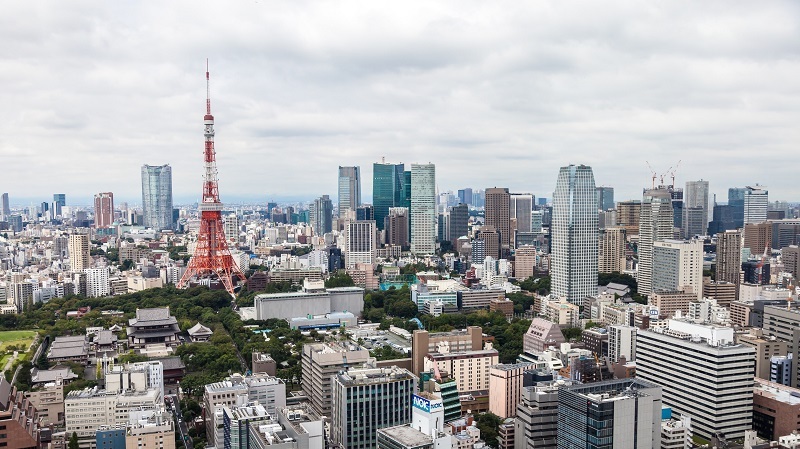 Japanese banks have been stepping up overseas investment and lending since the 2008 Global Financial Crisis (GFC), a period in which Western banks started scaling back on their foreign exposure. 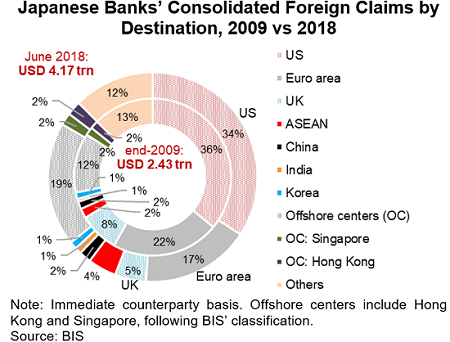 With foreign claims having grown by over 70 percent since 2009, Japanese banks have re-emerged as global leaders in cross-border financing, a position they once held from the mid-1980s through the mid-1990s. Given the already sizable exposure to the U.S. and Europe and difficult access to China and India due to the tight regulatory restrictions on foreign banks, Japanese banks have been heading to Southeast Asia to take advantage of the opportunities provided by the economies’ rapidly growing markets. An aging population, sluggish economic growth, persistent deflation and the large surpluses of Japanese corporations as well as the ultra-easy monetary policy of the Bank of Japan have contributed to Japanese banks’ low profitability, initially prompting them to expand globally through the 2000s. Following the Global Financial Crisis, Japanese banks have been further motivated by the deleveraging of European banks, which gave them and other local Asian banks an opportunity to increase their market shares. 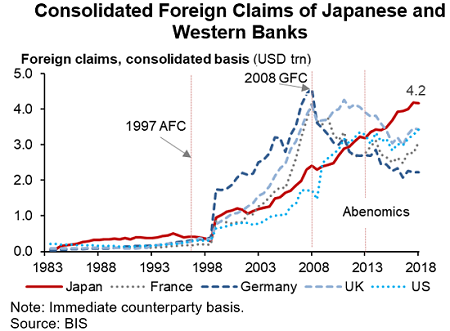 Accordingly, Japanese banks’ consolidated foreign claims have almost doubled in less than a decade to USD4.2 trillion as of the second quarter of 2018, comprising 21 percent of the world’s bank claims and over 80 percent of Japan’s GDP. 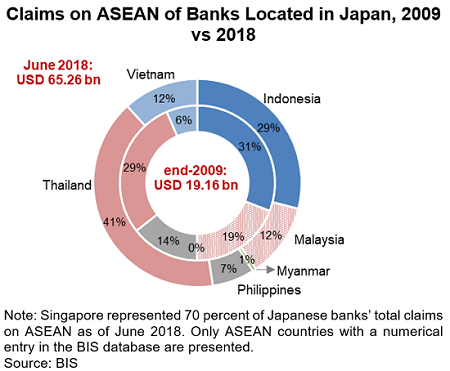 In particular, banks located in Japan represent 20 percent of the total claims on ASEAN as of June 2018, up from 17 percent in 2009. As a financial center, Singapore takes up bulk of the claims of Japan banks on ASEAN at USD152 billion. Meanwhile, claims on the rest of ASEAN amounted to USD65.3 billion as of June 2018, with Thailand taking up the biggest share at 41 percent, followed by Indonesia at 29 percent, and Malaysia and Vietnam at 12 percent each. Overseas expansion has been an income growth driver for many of the Japanese banks. Take the case of Mitsubishi UFJ Financial Group (MUFG) – Japan’s largest bank – where net foreign interest income, which accounts for about 40 percent of the group’s net revenues, has offset the decline in the net domestic interest income in recent years. However, the gains could also come with increased vulnerability to external shocks. An AMRO spillover model presented in the 2018 Annual Consultation Report on Japan suggests that the megabanks would be significantly affected if their global counterparties, particularly those in Europe and ASEAN, experience a deterioration in credit quality. To put things in perspective, the megabanks will likely incur credit loss equivalent to their core capital combined, if a system‑wide shock sends many of their global counterparties into speculative grade. Also, a sizable portion of Japanese banks’ operations are funded short-term, and the loan‑to-deposit ratios for overseas loans are more than 100 percent as in the case of MUFG. Therefore, Japanese banks can be more susceptible to higher USD funding costs arising from the policy rate hikes in the U.S. than other foreign financial institutions with a relatively larger deposit base. Such upward pressures in funding costs, in turn, call for closer monitoring by supervisory authorities as some banks may be motivated to increase their lending to firms with a higher risk profile in order to earn a higher return. Lastly, while the model suggests that outward spillovers from Japanese banks remain modest, ASEAN economies should still be mindful of the spillover risks. The region’s economies need to strengthen their buffers to guard against the risk of a pullback by Japanese banks of their ASEAN exposure, potentially arising from a normalization of the BOJ’s monetary policy or balance sheet stress on Japanese banks at home or overseas. 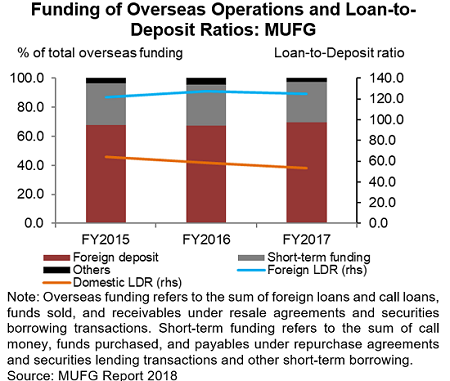 Also, a sizable portion of Japanese banks’ operations are funded short-term, and the loan‑to-deposit ratios for overseas loans are more than 100 percent as in the case of MUFG. Such upward pressures in funding costs, in turn, call for closer monitoring by supervisory authorities as some banks may be motivated to increase their lending to firms with a higher risk profile in order to earn a a higher return. In an increasingly inter-connected global financial system, regulators in the region should strengthen cooperation in the supervision of cross-border capital flows to reap the mutual benefits of cross-border finance while preserving financial stability.